When I was in my mid twenties I found out that I liked whisky, I’d always been a beer and cider drinker, but now I’d discovered whisky as well. I knew very little about whisky and certainly nothing about single malt whisky. This was in 1991, I was 26 years old and was just about to start my last year of college. I’d been working for the summer as a Class 1 lorry driver, so had a bit of cash saved and my girlfriend and I had decided to take a holiday. I had bought myself an old TR7 sports car, I’d always wanted one, she was old and slow, but other than that, in fairly good shape, so we decided to take a trip around Scotland, keeping to the coast as much as possible. We set off from her parents farm in Cornwall and headed off, it took a whole day to get into the highlands and the following day to get across to Skye. This was the first time I’d been to Skye, and it was stunning, the weather was very changeable but mostly fine but cold, we did most of the tourist things, visited Portree, even went to Talisker but it was shut! Then we decided to take a trip out to Neist Point Lighthouse, it was quite a drive from the campsite so we stopped for coffee at a small tea room called The Three Chimneys Tearooms. If you go there now you have to book well in advance as it’s so busy, with a well deserved reputation for its seafood, but back then it only had 6 tables, and the small side room was a whisky shop. Well, this was the first proper whisky shop I’d ever visited, I didn’t know that there were so many single malt whiskies available! Back in the early nineties single malt whisky was nowhere near as popular as it is now, the only readily available brands were Glen Livet, Glen Fiddich, Glen Morangie, and sometimes Laphroaig, so to be faced with 30 or 40 different single malts was astonishing! I settled on a 35cl bottle of 15-year-old Caol Ila bottled by Gordon and McPhail and it cost me £50, which didn’t go down too well with my girlfriend! After a few days on Skye we continued on our tour up the West Coast, but I was determined to visit a distillery, I wanted to know much more about this new interest! We finally arrived at John O Groats and set up camp in the campsite just across from the hotel, it had been a long day so we popped into the hotel for a quick beer before having an early night. I remember that the weather was foul, howling wind and horizontal rain, and on entering the hotels bar what did we see but a wall of different single malt whiskies, 92 according to the barman. The only other people in the bar were a couple of middle-aged bikers who we soon got chatting with, they were half way through a trip around the coast of Britain, but were having a 2 day break at John O Groats. These 2 chaps were well into a session, having tried a good few whiskies, and they promptly talked me into having a few with them, I as getting lots of advice on what to drink from the 2 of them and from the barman, and may have had a few too many! 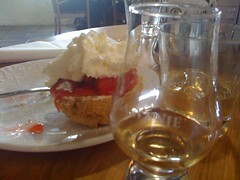 I distinctly remember buying a shot of Glen Garioch for £6.20, it was whisky of the week and I loved it! These were the days when a shot of whisky (blended) would cost about £1 or so, so £6.20 was a huge sum to pay for a single shot, but I remember being really impressed with it! We left soon after that, back to our small tent in the wind and rain, but warm and happy. The following day we went for a day trip to the Orkney Islands, we took the ferry and had a day on a coach visiting the tourist parts of the Islands. If you ever get the chance to visit Orkney I highly recommend it, the islands are beautiful, and there is so much history in such a small area, its wonderful! The day after the Orkney trip we set off south, turning left at Inverness and heading into Speyside, and the Whisky Trail, we found a lovely campsite and set off to visit some distilleries! Over the next 2 days we visited six or so distilleries, and at most of them I bought at least one bottle, nothing too outrageous, just the distilleries own bottlings plus a couple of others. At this point we had run out of time, we had to pack up and return to Cornwall so that’s what we did. 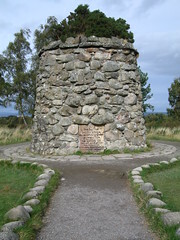 We did have one last stop at the battlefield of Cullodenwhich is a very moving place, well worth a visit. Once I’d dropped my girlfriend off in Cornwall I returned home to Marlow to assess my purchases, and although they were all great the ones that stood out for me were that Caol Ila, and one that was to become an all time favourite, Longmorn15. Ever since that trip I’ve been a passionate whisky fan, and I’ve returned a couple of times to visit more distilleries and more Islands, and whats more I can’t wait to go back! « There’s lots Of Life Afloat!